On 24 March 1877, Captain William Townsend subdivided Portion 32, donating Sub. 1 (1 acre) to the Corporation of the Presbyterian Church of Queensland. Much later, in 1884, the North Pine Presbyterian Church was constructed on this land by the well-known pioneering local builder and landholder, James Foreman, for the sum of £142. Church services began before that date in various homesteads and, from 1877, in the old slab school building in Sweeney Reserve. The church was opened on Sunday 8 June 1884 by the Rev. Alexander Macintosh at a ceremony chaired by Tom Petrie. North Pine Presbyterian Church, ca. 1900. 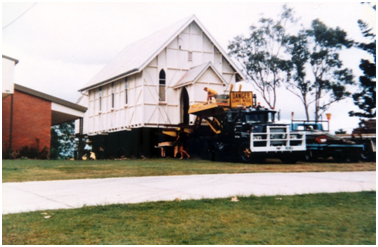 Removal of the North Pine Presbyterian Church from its original site to the North Pine Country Park, 1985. 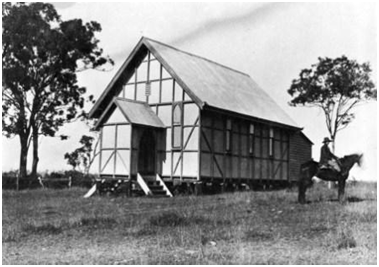 Around 1911, at the time the North Pine township was renamed Petrie, the front doors of the church were replaced with doors from Tom Petrie’s Murrumba homestead. The ceiling was inserted during World War 2. Originally at 57 Old Dayboro Road, Petrie, the building was moved to the North Pine Country Park in 1985. It is protected by the Queensland Heritage Register.